The Monster in My Pocket video game is an underrated and often ignored gem in the NES library. Let's take a look at the monsters found inside the game and see how they stack up against the toys! I have always loved tiny toys and playsets. M.U.S.C.L.E., Battle Beasts, Mighty Max, Trash Bag Bunch, Z-Bots... basically if it's a tiny toy, I'm interested in it. But none of those toy lines made me freak out as much as Monster in My Pocket did! I was obsessed with them, and I still have all the toys I had when I was a kid. They were tiny, they were monsters, they were squishy! Everyone in my class had these things. We would keep them in fanny packs and had them on our person at all times. Monster in My Pocket was a series of small rubber figures released by Matchbox in 1990. In 1991, Konami released a game based on the toy line. There were several characters that did not make it into the game, but most of the monsters from series 1 are featured in the game. Series 1 monsters that were not featured were Werewolf, Griffin, Jotun Troll, Vampiress, the Phantom, Mad Scientist, Mummy, and the Invisible Man. The monsters in the game will give you points based off of the point values found on the actual figurines, which is really neat. For example, Winged Panther would give you 5 points, Ghoul would give you 10 points, Harpy would give you 15 points, and so on. The game does a very good job of bringing the immovable rubber figures to life, and even though the sprites aren't all that big, you can still tell which monster it's supposed to represent. Some of the sprites are exceptionally spot on! Another cool thing is that the game included a monster you couldn't find anywhere else! 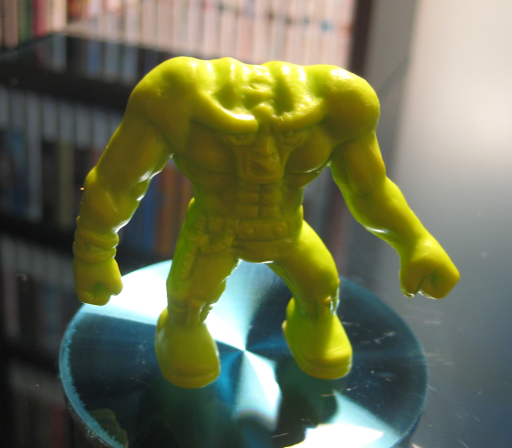 Included in each copy of Monster in My Pocket was a Blemmyae figurine! Blemmyae was part of series 3, which was an ultra-rare series consisting of unreleased figures and figures that were given away as premiums. Oddly enough, even though Blemmyae was featured on the box art to the game, the monster was not actually in the game itself. The Werewolf was also featured, and he too is mysteriously absent. My only complaint with the game is the odd choices they made with the bosses. In the series 1 figures that the game is based on, the highest point value given to a monster is 25. To me, the 25 point monsters would have been better choices than some of the monsters that got picked to be boss characters. Spring-Heeled Jack is the boss of the first level, and he's only a 5 pointer! Meanwhile, the Hydra is worth 25 points, and he's just a normal enemy. Strange choices from Konami. So let's take a look at these monsters! I've included their point values, the colors they were available in (except the neon versions from series 1), and my thoughts on some of the toys. They're numbered based off of what number the figurine was. Skipped numbers are monsters that did not appear in the game. I also grabbed the quotes from the Monster in My Pocket Wikia. I believe they're the same quotes that were on the pamphlet included with the toys, but I'm not completely sure. "Large monster with the head of a bull and the body of a man. Very fast and strong." I think it's odd that the Minotaur is the only monster from series 2 other than the final boss that appears in the game. Why include the Minotaur at all? There were a handful of monsters from series 1 that didn't make it into the game, so why pull one from an entirely different series? It is a mystery. "The master of magic, more powerful than wizards or sorcerers." I think Warlock makes more sense than the Minotaur to be included in the game, but still... the final boss should have been Great Beast! "A horribly disfigured man that lives in towers and dumps hot melted lead on his victims." "Human bones which capture people as revenge." I have always loved skeletons. Even as a kid, I always wanted to own a real human skull. I know that's bizarre, but it's the truth. Because of my affinity for skeletons and skulls, I always really liked this figurine. Bonus points to the game, because they did a fantastic job of converting the toy into a sprite. "Has eyes of flame. Can jump hundreds of feet; is a bogeyman." Why he's a boss character in the game I'll never understand. He's a 5 point monster! "Female who practices black magic with potions, curses and spells." "This is a knight that is now a wild beast. Can only be tamed by a woman." "A cruel, filthy old man that ferries the souls of the dead into Hades." "This beast has all the strength of a panther but can also fly." The purple Winged Panther is the best! I don't know if this is an actual monster or just something they made up. He seems kind of underwhelming. "A very mean little monster that robs graves, feeds on the dead and helps the evil." I've always hated the Ghoul toy. He's a little bald fat guy. But, he was one of the strongest monsters I had when I started buying them, so I guess he was good for something! "Small flying creatures who love to bother pilots or cause aircraft trouble." I love this figure. He's a great looking toy! "An enormous scavenger bird big enough to carry off two elephants." If you set Roc on your thumb and then put your index and middle fingers on his wings, you can make him flap his wings. Also, around the time these toys came out, there was a show on Fox called Roc. It didn't star the bird, though. "A living corpse that feeds on the blood of the living and makes them his slaves." One time when I was a kid I nailed a Vampire Monster in My Pocket toy to a tree in the woods. It's probably still there! "A giant that eats people. He is scary, but stupid and easily fooled." "The spirit of a person who died too soon. They scare the living as revenge." The Ghost is a really cool toy, and the game did a fantastic job of converting it over. I would always push the Ghost's head down and then quickly remove my finger so it looked like he was pulling his head off. "A fire-breathing lion with a snake's tail and a goat head on its back." "Dead person who has been re-animated. Used as a weapon he can't be killed." Zombies are in vogue now, but back then, they weren't really anything special. Looking at him now, I think he's a really neat figure. They really captured the look of a zombie in this toy. If they made these figures now, he'd probably be stronger than 10 points. "The watchdog of Hades. Has three heads, a snake tail and snakes as a collar." "A very mean, distorted being who hides in dark places to scare people." "A woman with snakes for hair. Look at her and you turn to stone." You fight several Medusa illusions in the game, but only one is the real deal! She flies around in the game, but I never had that as one of her abilities. "Evil goblin who lives in old ruins and dyes his cap with blood." The red version of Red Cap was the only one that mattered. You have a green Red Cap? What a loser! "A man-eater. You can become one by resorting to cannibalism." Windigo has a punching fist! Not only that, but he has a shoving hand and a biting mouth! This toy has everything. Definitely one of my favorites. "A goblin that is mischievous and plays childish pranks." The Hobgoblin was a super popular toy because around the time series 1 came out we were getting into comic books. The Spider-Man villain Hobgoblin was a big deal at the time, so everyone wanted the Hobgoblin Monster in My Pocket! "A huge head with many rows of teeth and legs. On its snout is a lure to catch prey." Can't really do much with Haniver here. He has a big biting mouth, but that's about the only way you can play with him. I would typically have him as a fireball shooting immovable sentry. "Evil, twisted creature that can shriek to drive its victims to madness." "A beast who walks with his head near the ground. If you look into his eyes you die." "The Hindu goddess of destructive forces with skin that sheds like a snake." "Flies in a pot to stir up storms and hurricanes to catch victims." I've never liked Baba Yaga. It's a pretty lame figurine and I don't remember ever doing much with it. "This huge hairy beast is thought to be the missing link between man and ape." "Has clawed hands and feet, eats filth, and breathes it as a weapon." "Underworld god who destroys those who violate sacred temples." When I played with this toy, I always had him smacking the skulls he's holding together to create storms. I don't know if I read that somewhere or if I just made it up as a kid. That's one of the great things about these toys; since they're rubber, you can move them even though they're not articulated. "Has a lion's body, human head, and poisoned spines that it can shoot like arrows." "Violent creature made up of pieces robbed from graves and then brought to life." "A sea creature so huge, sailors mistake it for an island and get their ships crushed by it." I like that they actually made him very large in the game. He's a Kraken, he shouldn't be some small normal enemy. He's so big in the game you only see his head and two of his tentacles! "A being with the upper body of a man, the lower body of a fish." Triton is a pretty cool figure. He has a punching fist, which is always a nice feature. In the pamphlet included with the toys, he was pictured holding what looked like a two pronged fork or a slingshot. The actual toy did not include this weapon, though. "These winged beasts capture those who are in the forest after dark." The Tengu figure is awesome. This toy was super popular among my friends. "A race of giants with one eye in the middle of their foreheads." "A monster that is part serpent, rooster and bat, and can kill with its gaze." I had a neon pink Cockatrice that I got out of a box of Shredded Wheat cereal. I called him "Bubblegum Cockatrice" and he was more powerful than the other ones. "The king of the dinosaurs." "An outrageously huge beast which some say is the king of all beasts." I'd put the Behemoth pretty high up on the list of my favorite figurines from series 1. Yeah, you can't do much with him, but he just looks so cool. I like that his skin has a rough texture, and his hooves are really neat, too. "A flying serpent. When it loses one head, two more grow in its place." Being a 25 point monster, you'd think the Hydra's appearance in the game would have been more noteworthy. Instead, the Hydra appears early in the game as a normal enemy. And he's so tiny! The Hydra should be enormous! "An awesome, very powerful monster with many poisonous heads and wings." The Great Beast is easily my favorite toy in series 1. I think he would have made a cooler final boss in the game than Warlock. Maybe the game could have had Warlock trying to summon the Great Beast and you're trying to stop him. Instead, Great Beast is just a normal enemy flying through a cave. The Monster in My Pocket game was actually very good. It's surprising that a toy line of immovable rubber monsters translated so well into a video game. It has great music, controls well, and features almost all of your favorite monsters. Of the monsters not found in the game, I think the Werewolf is the most puzzling omission. The Werewolf was always very popular among my friends, so it's sad he wasn't included. Did you have any Monster in My Pocket toys growing up? Share some of your memories in the comments! I'd love to hear from people that enjoyed these toys as much as I did! I've a great childhood memories about this game. Actually I rented and played it with my game-mates in a weekend. What a great weekend playing until late hours eating pizza and coke while trying to beat this game. I remember being surprised with the large ammount of enemies and their behavior differences.